It's a shame they bungled the play on words with meet/meat. Think somebody got yelled at when the newspaper came out? Think that person ever dreamed his or her error would be highlighted on something called "the internet" 91 years later? I love the portion of the advertisment that reads: "scrapple2 that is eatable." 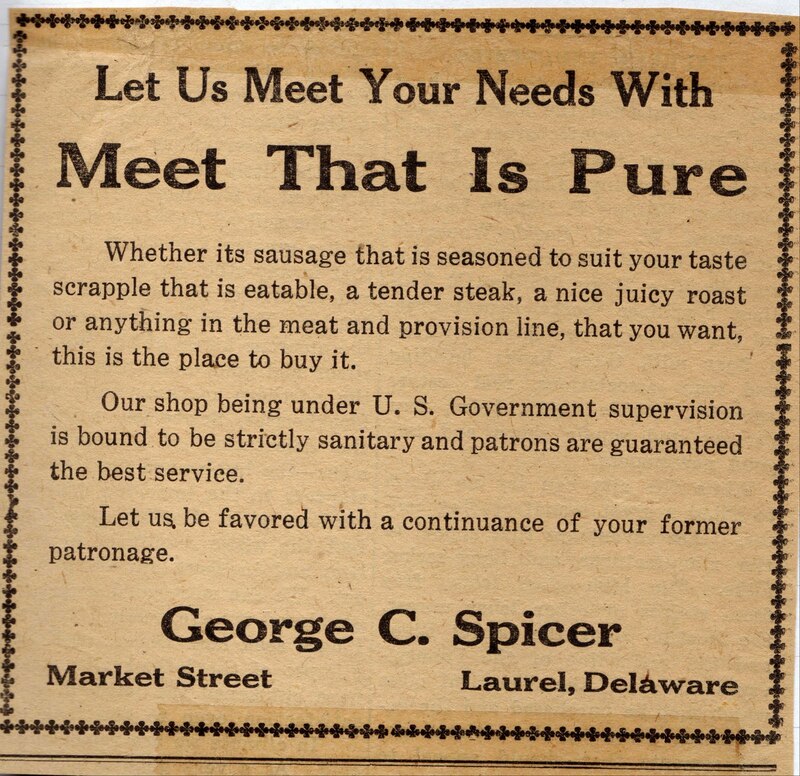 I couldn't find much more about George C. Spicer's sanitary, government-supervised meat shop. I do believe, however, that I found some information about Spicer's family tree. Seems he was born around 1890 and married Eliza Jane Culver around 1913. They had five children: George Irving Spicer, Anna Louise Spicer, Mary Spicer, Edward Spicer and Erma Esther Spicer. 1. According to the Delaware Public Archives on the state's website: "The Laurel Gazette was a weekly newspaper published in Laurel. By 1896 it had combined with the Sussex Countian to form The Sussex Countian and Laurel Gazette. It was renamed The State Register in 1904." Thank you so much for sharing those scrapple links of mine! I would argue that few scrapples are "eatable," so I side with the ad!